Shares in Italian football giant Juventus fell by 22% on the Milan stock market on Wednesday morning, after the club was knocked out of the Champions League by Ajax Amsterdam. They recovered slightly but were down 15% at €1.43 (£1.24) in midday trade. The Dutch club triumphed 2-1 in Turin, in the quarter-final, second-leg tie, to take them through 3-2 on aggregate. Juventus has won a record number of Italian titles, and was a Champions League finalist in 2015 and 2017. The star-studded team, led by superstar player Cristiano Ronaldo, had been hot favourite to progress to the semi-finals of Europe’s top club competition. Shares in the club had hit a 2019 high of €1.71 earlier this week ahead of the game. But on Wednesday its shares were temporarily suspended after falling by nearly a quarter. 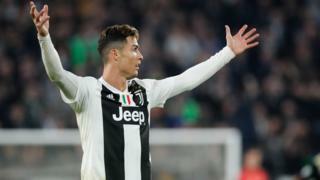 At Juventus’s Allianz Stadium on Tuesday night Ronaldo, a five-time winner of the tournament, headed the Italian hosts in front from a first-half corner. Then the Amsterdam club’s teenage captain Matthijs de Ligt’s scored to eliminate the Serie A leaders. Shares in Ajax were up 8.5% to an all-time high of €18.60 after their victory, valuing the club at more than €300m. For reaching the Champions League semi final Ajax will receive an additional €12m in prize-money, with an additional €19m available if they make the final and win it. Juventus was placed 11th in Deloitte’s annual world football rich list this January, with annual revenues of €350m, making it Italy’s richest club. Ajax failed to make the Top 20 of the Deloitte chart.